This is the only photo we have found so far of this ugly beast. We're not even sure what to call it as it appears to have the heritage of a mutt. Here's what we do know: The photo is dated July 1977 on the back, and FVFD members say it was only in service for a short period. According to Dave Nicholson, "Ferndale purchased this from Fortuna just so we could lower the fire class rating in the rural areas. Started and ran great, but it took 3 miles to turn it! We didn't have it long. Sold it to Carlotta Lumber. Took Fortuna off the door and never put Ferndale on." Yeah, why would you want to advertise that you owned this? Too big to fit in the hall, it was first parked behind the hall, but it was in the way of trucks for the meat market, so after that it was parked in Lino's gas station lot. So what is this beast? Jerry Lema was the first person to mention this one and he said we used to have an old Autocar tender and it was a real pain to drive. From the one photo it looked like a 1950s Autocar grill alright, and Jack Smith also remembered it saying Autocar on the grill. 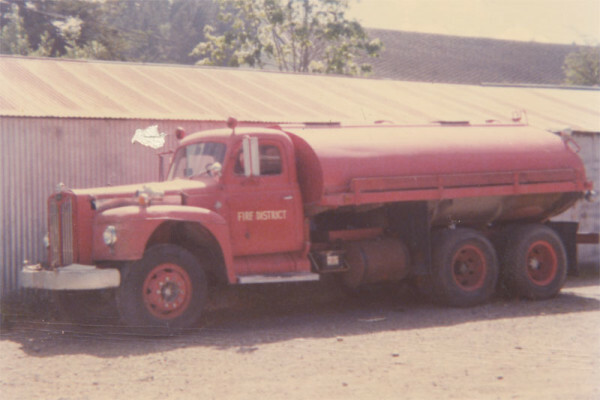 But, according to Dave Nicholson, "It was a Diamond T. They used an International cab, from the windshield back and the front end was manufactured by Diamond T. I believe it had a Cummins diesel engine." Looking up 1950s vintage Diamond T trucks, the fenders and cab are a match, but that hood and grill are definitely out of place. So best guess is that it is part Diamond T (which was already part International) and part Autocar.